We have featured Toshiba several times this year in our new ACG Report, and the twists and turns have been fascinating. The likely end result is both surprising and at the same time unsurprising, though the long term implications for governance could be ground-breaking. This post is taken from the latest issue of the report which is available free to subscribers. At the time of our last note (Issue 7), Toshiba had managed to fend off the immediate threat of delisting by getting its auditor, PwC, to sign the accounts, albeit with qualifications. This was no doubt a relief to the Tokyo Stock Exchange too. The longer term threat of inadequate capital was being laboriously addressed by the promised sale of its chip business, with a chosen buyer and two other bidders still being kept warm. The deadline here was March 2018, by which time the Balance Sheet had to be sorted. During September, Western Digital (a partner in the chip business with Toshiba and one of the bidders) offered to drop its legal action and abandon its bid on condition of a renegotiation of its JV with Toshiba. Meanwhile, Toshiba pressed ahead with its preferred sale to a Bain led consortium, culminating in agreement by the end of the month on a $18bn deal. This was followed by the Tokyo Stock Exchange taking it off its “at risk” list on the basis that its capital situation looked pretty certain to be safe by March next year. This seemed a little premature, but took a Japanese icon off the endangered list, which was no doubt part of the purpose. However, the rabbit out of the hat was the announcement very recently that Toshiba had put together a capital raising of $5.4bn from a large group of hedge funds, a sum amounting to over half its current market value, and that it expected to complete the deal by early December. The announcement on its website indicates that this sum will enable it to settle its liabilities in regard to the Westinghouse guarantee and sell its counter claim, thus sorting out its balance sheet and removing the threat of delisting. Assuming this does go through successfully, it will also remove the need to sell the chip business, and the word is that, in view of the beneficial result for Toshiba’s overall business, this abandonment might just be allowed to happen. And with one bound, our hero was free. Except that a number of these hedge funds are activist investors and when the voting numbers are added up in months to come they and the passive investing funds which will join the register after Toshiba’s rehabilitation may have a voting majority. That may provide a very different background for the Board when they look at their dividend policies and general openness and accountability to shareholders and other interested stakeholders. This story has much further to run and corporate governance will be high on the agenda. 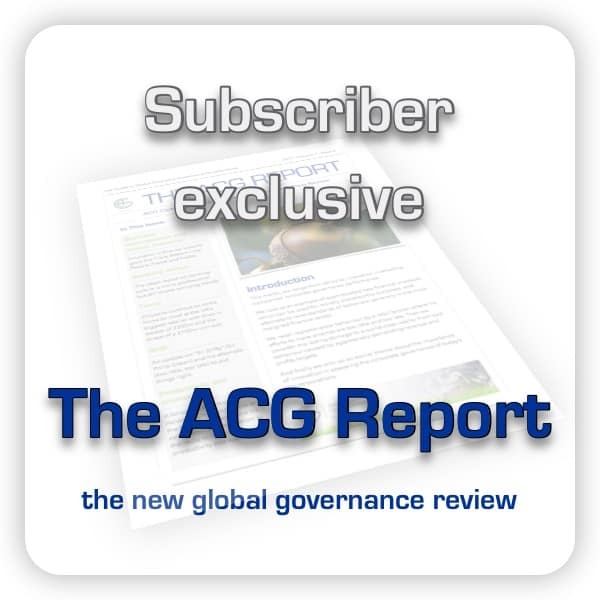 To further this aim, it has produced a 12 page Corporate Governance Guidelines document, which says all the right things and maps quite well on to the Japanese Corporate Governance Code, with a similar emphasis on the Board and Directors and shareholders, but making provision for the wider stakeholder groups. It also has a provision for whistleblowers. So we have an apology for past transgressions, a re-structuring to distance them from the past discredited model and a new set of governance rules. But without a system for stakeholder engagement, as we have advocated, will all this prevent something similar from happening again? 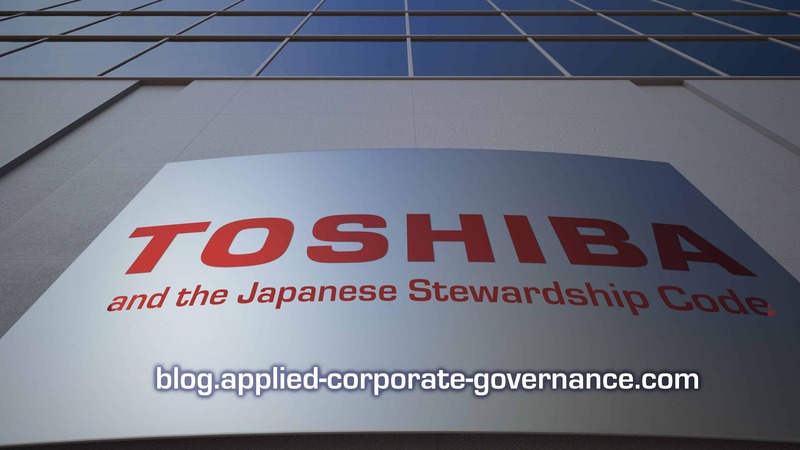 And what about the Stewardship Code and the activist hedge fund shareholders Toshiba is just about to acquire? What might be the possible impact here? Arguably, the current institutional shareholders have been fairly quiescent as Toshiba has been allowed to make a disastrous investment in trying to build a strong position in nuclear technology in the US and to cover this up in the accounts. Interesting parallels here with Thyssen Krupp similarly trying to build a big position in steel manufacturing in the US and Brazil, where the Supervisory Board allowed excessive exposure, it all started to go wrong, and poor governance led to bad behaviour, fines and ultimately the chairman’s resignation. The Japanese Stewardship Code exhorts investing institutions to take an active interest in their investees and to make sure that they have adequate technical knowledge to be able to monitor what is going on and to be able to have meaningful discussions with the directors of their investee companies. As we have said above, this doesn’t seem to have happened with Toshiba, but the new active investors are likely to be very different. The likes of Elliott Management Corporation will certainly possess the in-depth knowledge, and are likely to engage very actively with the Board and be unforgiving in their demand both for all desired information but also for a meaningful say in strategy. We can only applaud this, while hoping that the Board, if not Elliott, will give proper weight to the interests of the other stakeholders in the new Toshiba that is being promoted..
Business Education Trends: Time to Change the MBA?